Cambodians love to eat! 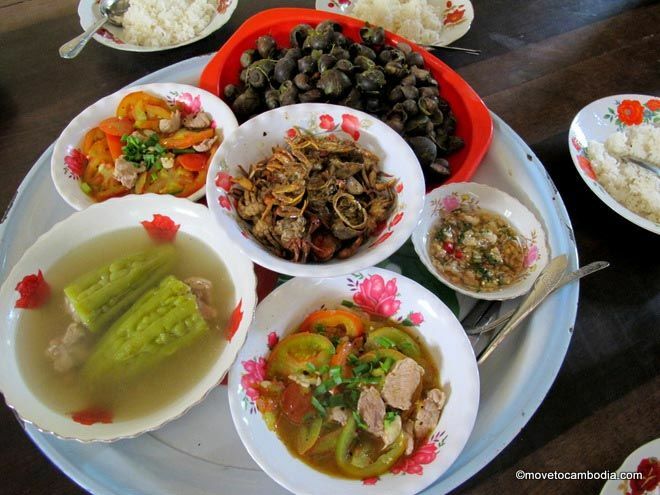 Once you learn more about local cuisine, you’ll soon love Cambodian food, too. Cambodian food is perhaps the most overlooked of all Asian cuisines. Too often Cambodian cooking is dismissed as a lesser version of Thai or Vietnamese fare. Living in Cambodia will give you the chance to learn about this much misunderstood cuisine and enjoy its unique charms. A typical homestyle meal will usually include a soup and a couple of stir-frys. Rice is not optional. It’s true that Cambodian food has much in common with that of its neighbors, particularly the cooking of Vietnam. Many dishes that are widely known as Vietnamese are also common in Cambodia. (Remember, part of southern Vietnam used to be part of Cambodia not so very long ago, and both countries have a shared history of colonization by the French.) For example, those tasty East-West sandwiches, called banh mi in Vietnam, are just as popular in Cambodia, where they are called num pang pâté. 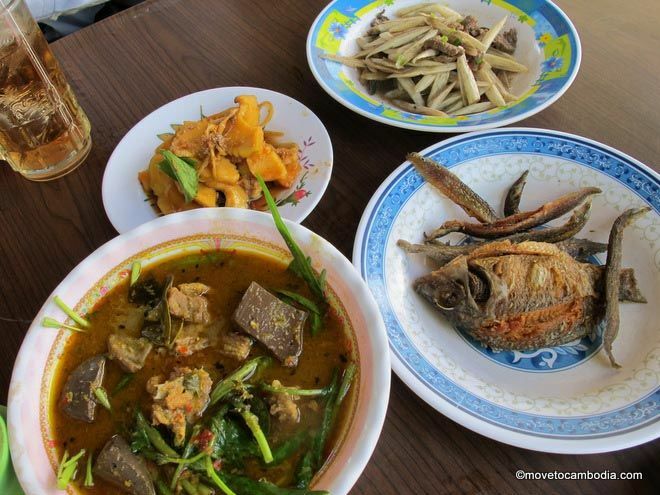 Other Cambodian dishes are more similar to Thai food, although Cambodian dishes usually contain less chili and less sugar, and coconut milk appears less often. The most important part of every meal is rice. In fact, Cambodians greet each other by saying “Nyam bai howie nov?” (“Have you eaten rice yet?”) At lunch and dinner in Cambodian homes each person is served a large bowl of rice. Then at least three or four other dishes, usually including a soup (samlor), are served family-style. Prahok, a pungent fermented fish paste, is used to flavor many dishes and for expats can take some getting used to. Kroeung, a distinctive spice paste made with a base of lemongrass and galangal, is the foundation of many Cambodian dishes. Freshwater fish from the Mekong and Tonle Sap make up a large part of the Cambodian diet, whether dried, processed into prahok, or cooked up in that famous Cambodian speciality, amok. A Cambodian meal usually includes at least one dish that includes fish from the Tonle Sap. Cambodian are consummate snackers, and a mid-afternoon bowl of noodles is the perfect pick-me-up. 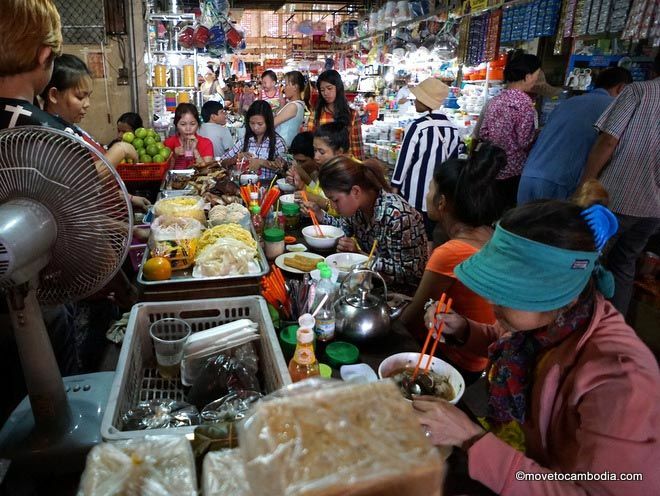 Other street food favorites include iced coffee with sweetened condensed milk (kar-fe toek doh koh toek gok), fried noodles (mi char), chive cakes (num kachay), and paté sandwiches (num pang pâté). You’ll find these dishes sold by roving vendors pushing carts around town and at small restaurants that set up shop on the sidewalk. For adventurous eaters, street food is a great way to learn about local fare while on a budget. On the street many delightful dishes usually cost no more than $1, far less than at Cambodia’s Western restaurants. For those who aren’t convinced that they will like Cambodian food, there are hundreds of restaurants serving all types of international food in Cambodia. American, British, French, Italian, Korean and Japanese expats have all set up restaurants serving their country’s specialties, and that’s not all. Those who are looking to follow a vegetarian, vegan, or halal diet will find many options. While local cuisine may be the least expensive choice, your favorite foreign comfort food won’t be hard time come by, both in restaurants and supermarkets.